It is with utter dismay and sadness that we need to confirm the murder of Rod and Rachel on the 10th February. Their bodies were dumped in the Tugela River and search still continues for them. What an unbelievable situation and loss for us all. As close friends and family of Rod and Rachel Saunders, we wish to express our shock and dismay at their alleged abduction, on the weekend of 10th-11th of February. We are grateful for the support we have received from SAPS, the Hawks and the British High Commission. The situation remains extremely sensitive. We appeal to members of the public with any information about their whereabouts to report it to the police (086010111 or SMS the anonymous tip off line, 32111, or contact Col Flynn on 0798866792). We ask friends and the press to use their discretion as Rod and Rachel’s well-being is at stake. We appeal to the kidnappers to behave with restraint and return them to us quickly and in good health. We trust that the authorities are doing all that they can to ensure that Rod and Rachel come home to us soon. Our hope and prayers are that they remain safe. Rod and Rachel have been members of IPPS Southern Africa since 1997. They are well known in the global IPPS community for their friendly and generous nature, always willing to share their incredible knowledge of the Southern Africa Flora. "Why Them?" you may also be asking. On February 8, four days before they were apparently kidnapped, Nick Bailey, a presenter on the BBC show Gardeners' World, tweeted a photograph of himself with the couple. "These guys know their South African native plants...and vitally where to find them," he tweeted. Three days earlier, Bailey tweeted: "No filter, just the Drakensburg Mountains in all their 5am glory. Off plant hunting today in pursuit of some rare gladioli. Can't wait! (sic)"
The Kogelberg Botanical Society website posted a notice earlier this year announcing that the Saunders' would be speaking on gladioli in Betty's Bay in the Western Cape on January 20. "A number of them grow in the summer rainfall regions of South Africa, and a number of them flower in midsummer," it said. 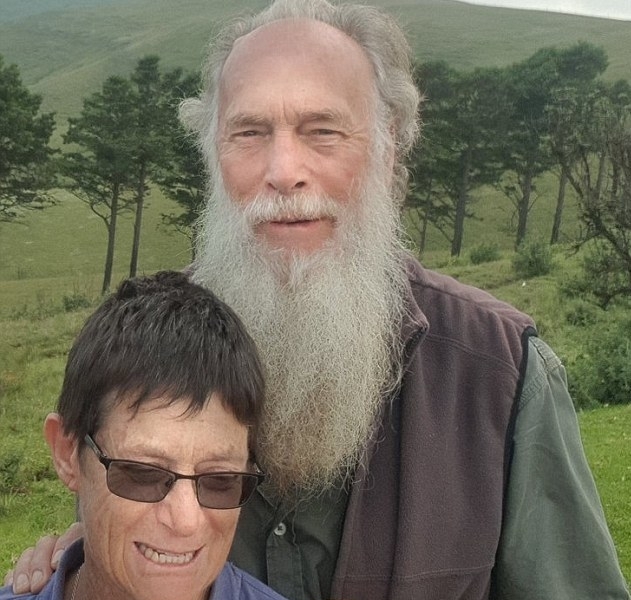 "Rod and Rachel have visited the Drakensberg four years running to try to find several species that flower in December in the mountains. As of today, they have found and photographed 164 of the South African species, and only have one left to find – Gladiolus uitenhagensis which comes from close to Port Elizabeth." According to a website, they own the Cape Town company Silverhill Seeds, which is based in Kenilworth. 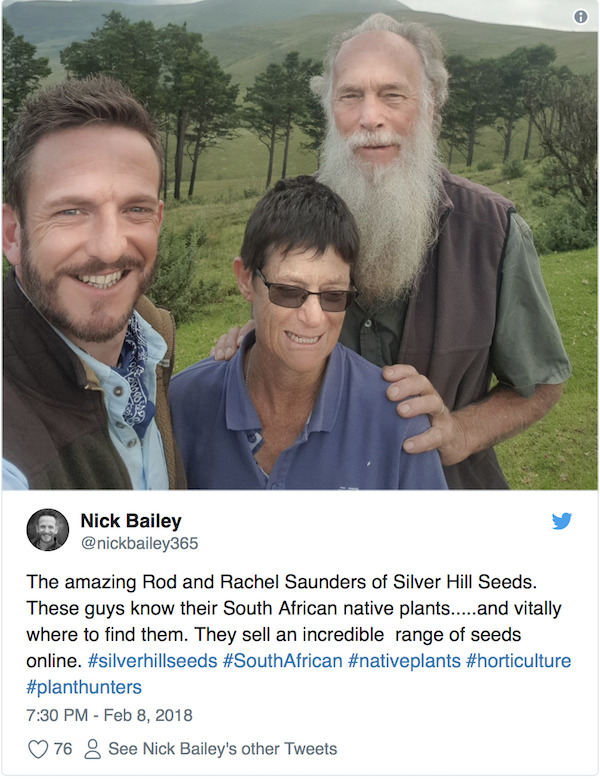 "Silverhillseeds.co.za is an independent company owned by Rod and Rachel Saunders," the company's website says. The Pacific Bulb Society website provided details about the couple. "Throughout much of the year they travel around South Africa collecting seeds. Rod is the former chairman of the Indigenous Bulb Association of South Africa, a first-rate photographer, and a popular speaker," it said.